Everyone should be allowed a certain level of privacy in their relationships. Soul mates and twin flames deserve the same amount of privacy we give other relationships in our lives. Just because someone desires some privacy does not always mean they are hiding something. Most humans want some alone time. 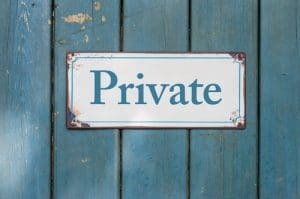 Some of our thoughts and feelings have a right to be private as well. Of course we want our soul mates and twin flames to tell us everything, but we don’t always need them to. If your soul mate or twin flame doesn’t really love your new haircut, can’t they keep that to themselves? There is nothing they can do, and still love you anyway. Since you hate it to and plan on growing it out, must they tell you how much they hate it to? No. They can keep that opinion private and it doesn’t lessen the relationship at all. If you like to sing in the shower when you are alone and don’t tell anyone, is that a problem? Of course not. Privacy can actually help a relationship and doesn’t have to be a red flag. However, there are some times when the need for privacy means something else. It could mean someone is hiding something that could get them in trouble and cause problems in your relationship. If you have a good reason to suspect someone wants seclusion for the wrong reasons, chances are you are right. Sometimes people demanding more ‘me time’ need to be alone because they want to keep their drinking or drugging from you. You may have given them an ultimatum and they said they would stop. But now the urge became too strong and they want privacy to do it behind your back. Soul mates would be more prone to seeking privacy because they are up to no good. This wouldn’t really occur with twin flames. Soul mates have a much more tumultuous relationship, and the need for privacy should raise eyebrows, especially if the couple are in the midst of soul mate chaos. Soul mates, moreso than twin flames should be more leery of privacy because often in soul mates there is an outside influence, and it could be trouble. Your soul mate could be talking to an ex, flirting with someone on the side, or getting ready to bolt. It depends on the soul mates and their current situation. Not all soul mates do this, but a lot of them do. Soul mates talk of an inner voice or a feeling that came over them that something wasn’t right. They knew deep down that their soul mate’s need for privacy was more than face value. Insecurities are often a part of soul mate relationships. (Again, not so much in twin flames) Insecurities can make a soul mate not want to give their partner any privacy. They read their emails, texts, check their phone, and check up on them. The other soul mate may see this as a violation and react in a negative way. If your soul mate has given you no good reason to be suspect, then allow them their appropriate level of privacy. Not everything has to be an open book, and that is ok.